The curriculum in English and Language Arts seeks to invest students with a natural facility and love for words. Through written and oral usage students experience, explore, and experiment with the capacity of language to express ideas and perspectives clearly, across a broad spectrum of voices. As they read and write creative, analytical, and expository texts, students learn to probe the formal connections among words. They consider the significant impact of figurative language as it broaches themes and topics with rich nuance, ambiguity, and complexity. Pondering some of the enduring questions of the human experience through the lens of stories, poems, and plays, from diverse cultures and eras, students will draw into increasingly sharper focus the critical relevance of knowledge, truth, virtue, love, and beauty to their own lives. The Nursery Division program fosters a love of stories and nurtures the incipient stages of literacy through story time, circle-time discussions, and journals. Themes and topics, selected in accordance with students individual interests and abilities, harness students’ innate inclination to learn by encouraging observation, discovery, reflection, and response. As students share their views, they learn to express themselves with growing dexterity. Hands-on, project-based learning experiences cultivate verbal and social communication skills in innovative and creative ways. As stories invite imaginative comprehension, they encourage the emergence of literacy by evoking students’ eager interests and inciting their joyful curiosity and enthusiasm. The Lower Division program extends and enriches students’ verbal and intellectual range and promotes growth in the core academic skills of close listening, articulate speech, engaged reading, and clear writing. Guided and independent readings expose students to a widening range of texts of increasing complexity. Lower Division students begin a systematic study of the formal rules of descriptive and usage-based grammar and build vocabulary through extensive reading. They begin to experience writing as a process, in which they revise their work over the course of several drafts, and practice how to offer constructive suggestions to fellow students during peer-editing sessions. Thematic units provide structure to cross-curricular approaches to literacy, with projects carefully calibrated to stimulate students to challenge themselves and take intellectual risk. Individual and group projects encourage independent thinking, reading, and writing within an ethic of cooperation and collaborative learning. 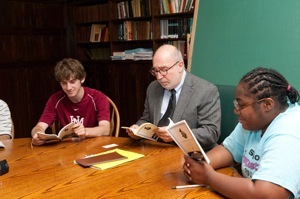 The Middle Division program nurtures the growth of students as readers, thinkers, and writers. Continued formal study of the building blocks and structure of phrases, clauses, and sentences helps to solidify students’ grasp of grammar, enhancing their capacity to craft authentic and convincing arguments. With the introduction of emotionally accessible and engaging works of literature students become acquainted with characteristics of the literary voice through close reading, analytical thinking, annotating, and responding in writing. As students learn to decipher the tropes of figurative language and analyze the personal and social themes of poems, short stories, novels, and plays through the study of character, theme, and voice, they begin to grasp the vivid significance of poetic language at increasing levels of sophistication. Each grade reads a Shakespeare play and works with actors to prepare live performances of scenes or monologues. A Division-wide Read-In Day, reading clubs, and publications encourage and accommodate individual interests in reading and writing. The study of literature in the Upper Division is organized around the major literary genres: poetry, drama, and the novel. Through extensive reading, students become more keenly attuned to the rich nuance of the literary voice; through intensive writing they explore the expressive power and splendor of the English language. Students hone their analytical skills through the study of a broad range of challenging texts, lively and probing seminar-style discussions, and focused, challenging critical and creative writing assignments. At each grade level, individual faculty members develop a curriculum for each of their classes embracing a diverse array of voices from a variety of literary traditions, periods, and cultures. This approach expands students’ awareness of the diverse range and scope of literature and broadens their understanding of shared concerns alongside an appreciation for differences across literary traditions, both within the Anglophone tradition, and beyond. Students in ninth and tenth grade engage in a rigorous and intensive review of formal grammar. Ninth graders begin their work in English with an ungraded writing trimester. Eleventh-graders complete a major research paper. The twelfth-grade curriculum is comprised of trimester-long electives that cover a broad range of literary periods, themes, and genres. One section of AP English is offered, with admission through competitive entry.